GEAR up for yet another crime thriller Legend, directed by Academy Award winner Brian Helgel, set to release on December 4. Tom Hardya��s double act in the movie is something to look out for as he essays the role of the infamous duo Ronald and Reginald Kray. We find out from Hardy about his experience shooting the film and more. Was Legend a tough film to make? It was challenging, yeah. But actually that anticipation of everythinga��ita��s one of those things that the flinch before the punch is a bit more painful than the punch landing a�� does that make sense? Once we started working on it, it was actually a really lovely puzzle to solve from a performer and collaboration point of view. What made you want to take on both roles? Just the challenge. I wanted to work with Brian (Helgeland, director of Legend). Therea��s a part of me that enjoys investigating the criminal underworld and that sort of stuff. The challenge would be to play two people. So as an actor there was a little bit of a challenge there for me as well in the training. Well, quite a big challenge actually. I didna��t know what I was doing. Who came easier, Ron or Regg? Ron really, to be fair. Therea��s a lot more options there to play for one. I suppose Ron was more pleasurable because he had a certain predictable unpredictably about him, which allowed me as a performer to have a bit more fun. That was obviously a challenge. Technically, how do you create life and a true believability between the two? In that way it was a pure nerd geek fest trying to work out how to play two characters. Tell us about the moviea��s title. 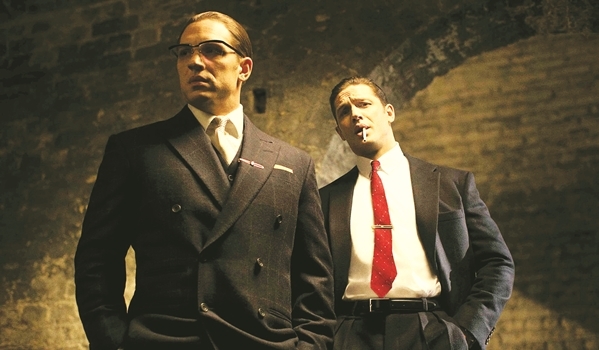 There are lots of myths that circulate around about the Krays. Most of them are made up by people who have no story. No one really knows the truth about them. Therea��s loads of material out there, but ita��s pretty much open to interpretation, some aspects. What do you think is so attractive about gangster movies? A lot of people like to go and experience life vicariously through other people. So ita��s a safe place to go and watch acting because people pretend to do things they would never do in real life. And they sort of take a load off to entertain you in a way such as you can vicariously enjoy a bit of naughtiness without actually having to participate in it. What was it that first attracted you to this film? Ita��s something that I wanted to do, I suppose rather selfishly, just to see if I could pull something off that was just a bit of a challenge for me. Other actors have done it, like Sam Rockwell and my mate, Noomi (Rapace), is doing seven characters right now. And what is it about the subject matter that appeals to you? Gangsters, crime and horror and all that sort of stuff has always been a sort of compelling fascination for people, hasna��t it? I like to watch things or investigate things I would never certainly do in my life. Scheduled to release in India on December 4, 2015.